How To Get Your Kids to Eat Spinach… and LOVE IT! After getting the fabulous Cook’n recipe organizer software for review, I started getting their monthly newsletters. After the first one, I was hooked. In that first one, was a recipe for a spinach smoothie. I was skeptical, but the owner himself did a video how-to of it so I figured it must be good. After making this for myself, I decided I had to share this as a how to get your kids to eat spinach because my kids were fighting over who got seconds! Just put all that in your blender and blend until smooth. It is super delicious. All you really taste is the peanut butter and banana. My kids beg for this all the time! I am so happy that they are getting all the nutrients from all that spinach and a bunch of protein. We make this at least once a week after hitting the gym. This original recipe called for almond milk, but I am super sensitive to almonds so I switched it to coconut milk. But you can use anything really–regular milk, soy milk, rice milk, etc. 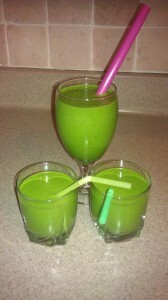 We love Green Monster smoothies in our home! Have you tried adding 1-2 tablespoons of flaxseed or chia seed? We use flax seed for the omega 3s! I JUST made this (as in, I’m drinking it right now)…and it is AWESOME. It’s good, isn’t it?? My sister wrote this and now I finally tried it – HOOKED!